A synthesis lab is like a shared house. You get a collection of usually unrelated people – both in a sense of not having any familial ties as well as not sharing character traits – that reside in the same space and argue over who’s taking out the trash. And, just like in any shared house, the lab is a place where ideas of tidiness and sharing clash. There are those ultra-tidy chemists that keep flasks sorted by size, NMR tube caps arranged by colour and all spatulas aligned north (although I was told that this isn’t merely obsessive tidiness but part of an ancient occult ritual to appease the chemistry gods). Others happily work around piles of flasks with mostly unknown content. These miscreants don’t think twice about setting up a reaction next to a syringe with needle still attached poking out from under a piece of blue roll. Some would call it a safety hazard; to them, it’s merely a deterrent for nosy colleagues. Although helping each other out is an essential element of every lab, each individual’s approach to sharing can be a major point of contention. After all, not all items placed within a shared space are also meant to be shared (I’m looking at you, former housemate who kept using my shampoo). 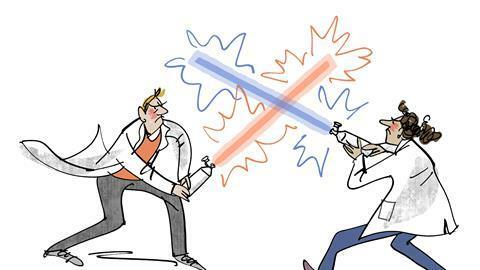 Over the years I spent in the lab, my colleagues and I entered into an ever more sophisticated, and often hilarious, arms race to sabotage each other’s ‘sharing’ practices. Hoarding and hiding is an obvious tactic to avoid your labmates taking your personal – meaning clean – glassware or using up the last bottle of the only solvent your compound dissolves in. There’s usually a lack of lockable locations in a lab, so be inventive. NMR tubes can be taped to the bottom of the bench. Your favourite round bottom flask can be hidden behind a strategically placed sharps bins. And those small glass vials with backup amounts of your favourite reagents? Place them inside an empty bottle of a boring-sounding chemical (sorry, potassium carbonate) and they should be safe from sticky fingers. The perfect hiding place will allow you easy access while being inconvenient for the thief – although the glove box or the bottom of the acid bath sound like fool-proof hiding places, they make recovering items an odyssey. Of course, eventually the best hiding spots will be uncovered. This is when another tactic comes into play: confounding the subject. I was once in command of a little army of squeezy wash bottles, each filled with a different solvent, which are great for quick refills during column chromatography or workups. Although clearly marked for my use only, they kept being emptied by an unknown assailant as soon as I let them out of my sight. I ended up spending more time refilling than using them. The trick when confounding your nemesis is to make items seem like easy targets and then let the trap snap shut at the right moment. I decided to replace my beloved squeezy bottles’ slightly faded labels to make them even easier to distinguish. For a few weeks, I keep patiently retrieving and refilling the empty ones. Then, one day, I removed the labels and filled all the bottles with acetone – in my lab, unlabelled squeezy bottles contained either water or acetone, so technically this was perfectly valid. Of course, the unknown thief didn’t realise that I had followed this convention with my personal collection. Soon, the thief was unmasked, and I got to enjoy the look on their face when they spent several minutes wondering why no layers formed in their separating funnel containing an aqueous mixture, despite having added solvent from my bottle that had previously contained diethyl ether.